The Sleekgeek Food List is divided into four main food groups: Quality Protein, Colourful Vegetables, Smart Carbs, and Healthy Fats. All of which you can combine together to make a healthy well-balanced meal using the Sleekgeek Healthy Meal Template and Sleekgeek Portion Control Guide. Meat: Beef, lamb, pork, wild game, etc. Poultry: Chicken, duck, eggs, ostrich, turkey, etc. Fish: Bass, hake, kingklip, mackerel, salmon, sardines, snoek, trout, tuna, yellowfish, etc. Seafood and Shellfish: Calamari, clams and mussels, crab, lobster and crayfish, oysters, prawns and shrimp, etc. Dairy: Milk, cottage cheese, plain yoghurt / Greek yoghurt, protein powders (whey and casein), etc. Plant-Based: Beans, chickpeas, lentils, peas, pulses, protein powders (rice, hemp, soy, etc), tofu, tempeh, edamame, etc. Protein-dense, providing a significant amount of protein per reasonable serving size or calorie amount. Minimally processed, single-ingredient foods whenever possible, and commonly found / easily included in a normal healthy diet. Proteins are the building blocks of life that every living cell in our body uses for both structural and functional purposes. We need enough protein to produce important molecules like enzymes, hormones, neurotransmitters, and antibodies. If you would like to read more about what protein is and does, Precision Nutrition has a great article: All About Protein. Without adequate protein intake, our bodies can’t function well at all and it also makes fat loss, weight maintenance, and muscle gain efforts much more difficult. A diet that is sufficient in protein has been shown to benefit those who are wanting to 1) lose weight, 2) maintain a healthy weight, 3) build muscle, as well as 4) improve their general overall health. It’s not just for bodybuilders or athletes. Protein can improve your appetite by reducing the levels of your ‘hunger’ hormone ghrelin and reducing levels of your ‘satiety’ hormone leptin. Protein helps you to feel fuller with less food and stay satisfied for longer while also reducing cravings and late-night snacking. Protein can boost your metabolism, increasing the number of calories that you burn each day and helping with weight loss or healthy weight maintenance. Protein not only helps you lose weight in the first place, but more importantly, it helps you to keep it off in the long-term. Protein forms the building blocks of muscle, helping you to build muscle and strength. It also helps to prevent muscle loss while dieting or as you get older (reduces age-related sarcopenia). Protein can improve your bone health by helping to reduce the risk for osteoporosis and fractures. It’s been shown that people who eat more protein tend to have better bone health as they age and can stay fitter for longer. Protein has been shown to lower blood pressure and possibly reduce other risk factors for heart disease. Protein helps the body repair tissues and organs, speeding up recovery after illness or injury. In fact, in our Sleekgeek Coaching Program, the very first nutritional-based habit we teach is to eat some protein with every single meal. We’ve found that when our clients start building their meals around protein, they automatically tend to make healthier choices thereafter. When it comes to building a healthy meal (such as with the Sleekgeek Healthy Meal Template) we recommend that you start with your protein and then build your meal up from there. The Dietary Reference Intake (bare minimum) for preventing deficiencies is 0.8g of protein per kg of body weight. HOWEVER, this is far from optimal for health and metabolism. Especially if we consider the dangers of protein deficiency and the benefits of sufficient protein intake. Also, the DRI does not take the additional demands of physical activity or weight loss / muscle gain efforts into account. Most people would be well-suited to consume around 1.5g – 2g of protein per kg of body weight. For a 70kg woman, this works out to 105g – 140g of protein per day. For an 80kg man, this works out to 120g – 160g of protein per day. If you are overweight or very sedentary then aim for the lower end of the range (closer to 1.5g of protein per kg of body weight). If you are lean, highly active, or trying to build muscle then aim for the higher end of the range (closer to 2g of protein per kg of body weight). Consuming 1.5g – 2g of protein per kg of bodyweight per day requires you to track the macronutrient content of your foods. While tracking your macros (and calories) is an effective strategy, it can be quite laborious and is not necessary for most people. Instead, we recommend using the Sleekgeek Portion Control Guide. This is a fantastic system that we use here at Sleekgeek in our own daily lives, as well as in our Sleekgeek Coaching Program with great success. It lets you simplify portion control by using your fist, palm, cupped hand, and thumb as rough measuring tools. Eating protein with every meal is the very first nutritional-based habit that we teach in the Sleekgeek Coaching Program. It’s a really great anchor habit to keep you on track and help you make healthier meal choices. Your priority is to get started and take action. 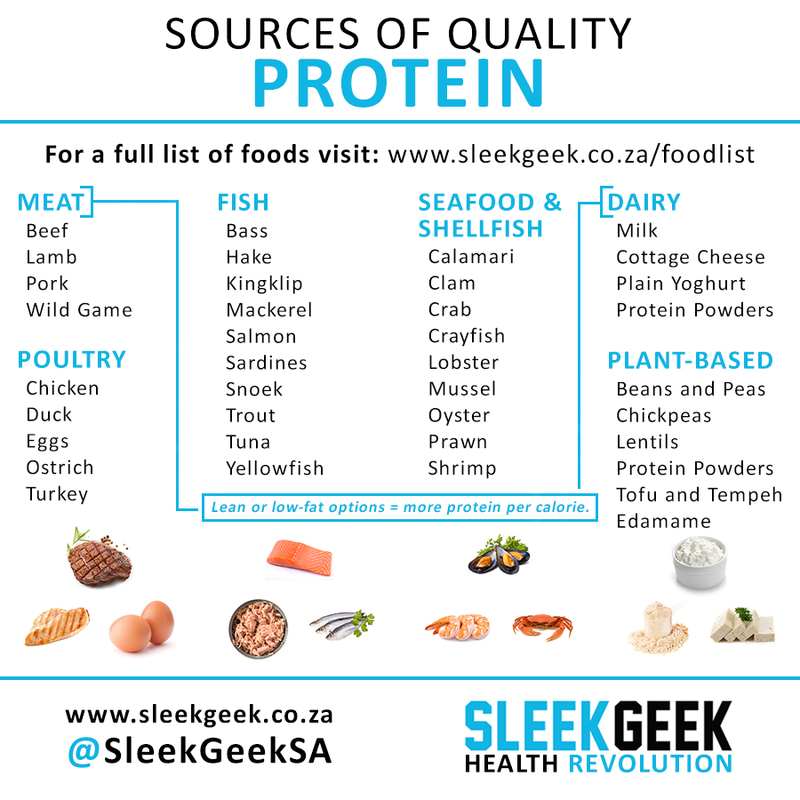 Print out the Protein-Dense Food List above or the full Sleekgeek Food List and get to know which foods are high in protein. Stock up on protein-dense foods and make sure that you always have them conveniently on hand. See the Sleekgeek Kitchen Makeover and Supermarket Survival Guide for help on this. Stick to easy and convenient sources of protein (buy them pre-prepped or pre-cooked if need be). Keep it simple and do-able. Try adding a bit more protein to each meal using foods that you actually like and are willing to eat. Consider healthy eating as a spectrum of best-effort choices where you want to try to make more good choices and less bad choices whenever possible, as opposed to an all-or-nothing approach of only being allowed to make perfect choices and considering yourself a failure if you make any bad choices at all. If you’re really struggling, consider supplementing with a protein powder. See the Sleekgeek Protein Supplement Guide for help on this. Your priority is to get more consistent, hit the right quantity, expand your variety, and improve your quality. Work on getting that protein in with every single meal, consistently. It’s not a meal if it doesn’t have protein! Focus on getting the right amount of protein, either using the grams per kg of body weight guidelines we gave above or the Sleekgeek Portion Control Guide. Experiment with different types of protein and see if you can expand your variety of choices. Try improving the quality of your protein – such as by buying organic or pastured meat, wild-caught fish, free-range, eggs, and food that has been sourced locally. Don’t forget that protein is just one part of your meal. See the Sleekgeek Healthy Meal Template for a broader perspective and work on building up a healthy well-balanced meal. Make sure that you ALWAYS have a handful of go-to protein sources on hand that are super easy to prepare and eat when short on time or low on willpower. If you fail to plan then you plan to fail. Proteins like biltong, tins of tuna, protein powder, tinned beans, and lentils are great to keep in your cupboards as they don’t perish and can be stored for a long time. Proteins like burger patties, chicken, salmon, prawns, and tofu or edamame are great to keep in your freezer saved away for a special occasion or for emergencies when you have no other protein to eat. Proteins like eggs, yoghurt, and cottage cheese are handy to keep in the fridge as quick and easy staples. Proteins like steak, pork, chicken, and fish are great to cook in bulk so that you can eat left-overs the next day. Getting into the habit of eating protein doesn’t need to be complicated or super fancy. It just requires a bit of effort up front, and then a system that you can continuously and regularly maintain. You will come to learn which foods you need to buy frequently and which foods you only need to stock up in bulk once in a while.